The story of Joseph Schereschewsky is unique in the annals of the Church. He was born on May 6, 1831, of Jewish parents, in the Lithuanian town of Tauroggen. His early education was directed toward the rabbinate, but during graduate studies in Germany, he became interested in Christianity through missionaries of the London Society for Promoting Christianity Amongst the Jews, and through his own reading of a Hebrew translation of the New Testament. 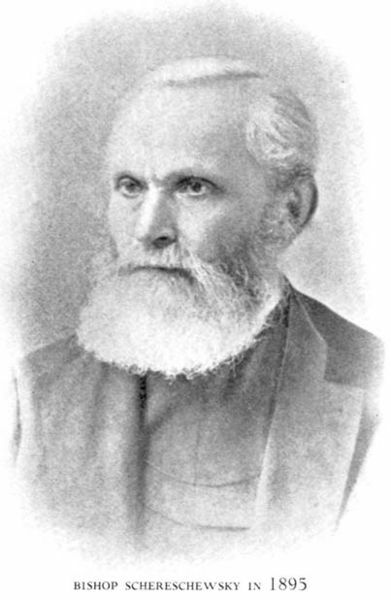 In 1854 Schereschewsky immigrated to America and entered the Western Theological Seminary in Pittsburgh to train for the ministry of the Presbyterian Church. After two years, he decided to become an Episcopalian, and to ﬁnish his theological studies at the General Theological Seminary in New York City, from which he graduated in 1859. After ordination, and in response to Bishop Boone’s call for helpers in China, Schereschewsky left for Shanghai. Always facile in languages, he learned to write Chinese during the voyage. From 1862 to 1875 he lived in Peking, and translated the Bible and parts of the Prayer Book into Mandarin. After Bishop Williams was transferred to Japan, Schereschewsky was elected Bishop of Shanghai in 1877, and was consecrated in Grace Church, New York City. He established St. John’s University, in Shanghai, and began his translation of the Bible and other works into Wenli. Stricken with paralysis, he resigned his see in 1883. Schereschewsky was determined to continue his translation work, and after many difﬁculties in ﬁnding support, he was able to return to Shanghai in 1895. Two years later, he moved to Tokyo. There he died on October 15, 1906. With heroic perseverance Schereschewsky completed his translation of the Bible, typing some 2,000 pages with the middle ﬁnger of his partially crippled hand. Four years before his death, he said, “I have sat in this chair for over twenty years. It seemed very hard at ﬁrst. But God knew best. He kept me for the work for which I am best ﬁtted.” He is buried in the Aoyama Cemetery in Tokyo, next to his wife, who supported him constantly during his labors and illness. I O God, who in thy providence didst call Joseph Schereschewsky from his home in Eastern Europe to the ministry of this Church, and didst send him as a missionary to China, upholding him in his inﬁrmity, that he might translate the Holy Scriptures into languages of that land: Lead us, we pray thee, to commit our lives and talents to thee, in the conﬁdence that when thou givest unto thy servants any work to do, thou dost also supply the strength to do it; through Jesus Christ our Lord, who liveth and reigneth with thee and the Holy Spirit, one God, for ever and ever. Amen. II O God, in your providence you called Joseph Schereschewsky from his home in Eastern Europe to the ministry of this Church, and sent him as a missionary to China, upholding him in his inﬁrmity, that he might translate the Holy Scriptures into languages of that land. Lead us, we pray, to commit our lives and talents to you, in the conﬁdence that when you give your servants any work to do, you also supply the strength to do it; through Jesus Christ, our Lord, who lives and reigns with you and the Holy Spirit, one God, for ever and ever. Amen. Hebrew reading: Might this be identified as Canticle 9, Book of Common Prayer 1979, page 86? This would encourage use of the Canticle as the reading IMO. He needs a statement of who he is and why he is important – in the first paragraph. Oh, and I just love saying Schereschewsky. I really do. And, he should be the patron saint of the QWERTY keyboard! I a looking for a source to confirm that Bp. Schereschewsky wrote this prayer: “I thank Thee, Lord, for the scholarship, for the time — and for my finger.” My source is the Anglican mailing list circa 1994, but I can’t confirm it now. A pronunciation guide would be helpful in this bio. Especially if it’s as much fun to say as Michael reports. A commemoration such as this one leaves one feeling humbled to the marrow. I know it has been in LFF for a while, but I still feel that a “thank you” should go to those who put it there in the first place. Just two comments. First, his wife deserves her mention in the bio. Sharing in that epic scope of ministry was no small commitment, and, I expect, sacrifice, on her part. Would it be possible to mention her NAME in that sentence, in future publications? Secondly, this collect is a great example of what I have pleaded for when my comments addressed trying to be too much an imitation of the exact accomplishments of the person remembered. The petition in particular asks for confidence that God will give the strength to meet our commitments. That works for everyone, and allows everyone to pray the collect meaningfully within each one’s context of living and ministry. I’m curious: In the collect, Schereschewsky is remembered for translating the Bible into the languages (plural) of China, but only one language mentioned in the text. Did SIJS, in fact, translate into more than one language? His is a wonderful name to sing in the litany of saints: Blessed Samuel Isaac Joseph Schereschewsky, pray for us. Here again we have a commemoration “bumped” under the old rule from the known date of his death. I suggest we should have one rule, consistently applied. Which is more important–to honor the date when a saint enters the Church Triumphant? Or that we find a handy feria, so that folk have a day to themselves? Now that we have abandoned the “one day, one commemoration” rule, shouldn’t we move all names so affected? The subheading fails to suggest why he is in the calendar. I suggest adding “and Translator of the Scriptures”, or some such. In line 1 of the second paragraph, we have another example of the solecism which does not distinguish between “emigration” and “immigration”. SIJS emigrated from Europe; only when he reached the US did he become an immigrant here. It is usual to write that a bishop who changes from one diocese to another is “translated”. Has that word been avoided in the third paragraph because the subject is a “translator”? It reads as if he was “transferred” by the unilateral action of a higher authority, whereas Bishop Williams presumably gave his consent to the move. In the penultimate line of the third paragraph, after “Weli” insert “(simplified Mandarin)”. Iwish we could say more about the life of this remarkable holy man He is one of my heroes.